Prompted by the request from Peter for pictures to submit to the BBC One Show’s “Jupiter spot”, Les took a sequence of web cam images of Jupiter and its moons. Les took video images every 20 mins or so from about 7:30 until midnight, and after processing composed this excellent animation. Click on this picture for a bigger better view. Note the movement of the Red Spot, and the satellites. Society member Rik McRae managed to capture the new supernova (now designated as 2014J) recently discovered in M82, through gaps in the cloud last night. The supernova is quite bright, around magnitude 11.7 at discovery and may be brightening, before it will inevitably dim from view. But it should be easy to see for at least the next couple of weeks – though a small telescope will probably be needed (6″ or more). 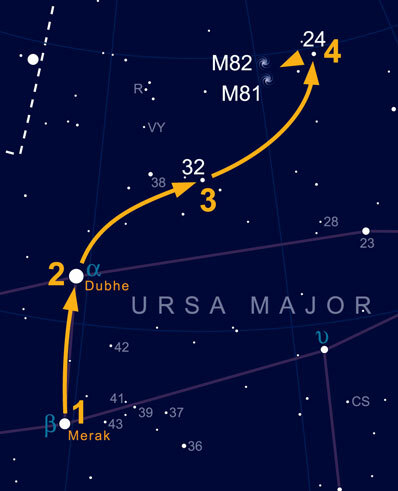 To find M82, you can use this useful finder chart from Astronomy Now, and read more about it here. Cotswold AS member Alan Mason managed to capture both Comet 2012 S1 ISON and 2013 R2 Lovejoy this month. Lovejoy has been a relatively accessible object, being fairly high in the morning sky. Comet ISON has been a bit trickier, being fairly low. If there are any clear mornings this week, it may be worth trying to observe for ISON in the early morning, 30 minutes before dawn. It will be at perihelion on November 28 (and un-observable for the couple of days around this), and will probably become visible in the morning again from December 1. What will we see then ? Well we just don;t know – it could be spectacular – it could be a damp squib.The only way to be sure will be to get up early and have a look! Tony Ireland managed to capture the triple conjunction of Mercury, Venus and Jupiter shortly after the sun set on May 26th. Mixed reports have been coming in from members who were trying to see comet C2011 L4 PanSTARRS on Wednesday March 13th. Much of the county had fairly clear evening skies, though some low cloud and haze on the western horizon made things difficult. Update: Picture from Ian Sibley taken at the SGL 8 astro-camp on 13th March.